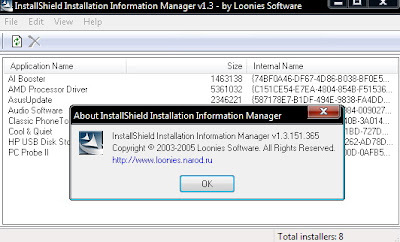 Loonies InstallShield Installation Information Manager ("ISIIM") helps you managing the archive of installers stored in your Program Files directory by the popular installation system InstallShield. ISIIM may be useful for those who have a lot of programs to clean the garbage left after uninstalling some of them. To delete an installer, select it and press the key , or click the button on toolbar, or select menu comand Edit -> Delete Installer. ISIIM may ask you are you sure you want to delete it. To define the behavior of ISIIM in this situation, open the dialog window "Preferences" (tab "General") and check or uncheck the appropriate checkboxes. ISIIM can be customized via dialog window "Preferences". You can open it with menu command Edit -> Preferences. ATTENTION! ISIIM doesn't backup deleting data. + Added WinHelp help system. Representatives of Microsoft conceal the fact that DirectX10 is not only for Microsoft Windows Vista, but also for other versions of Windows (Except Widows9x). 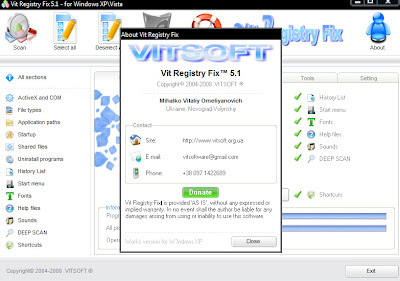 This set of libraries includes DirectX 10 files from Windows Vista, as well as additional files from other versions of DirectX. These libraries allow to increase the compatibility of new games and programs with Windows XP. And also correct mistakes with the launch of games requiring files with DirectX 9.0 and earlier versions of it. Just when there graphics card with support for DX10 make available those options, in the next-generation games that before the installation of these libraries were not available. 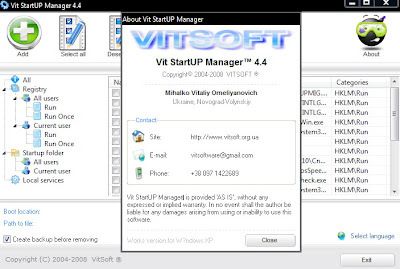 New Generation program, developed specifically for the operating systems Windows Vista ™ and XP, defines basic information on the operating system, RAM, processor (CPU), BIOSe, motherboard, video card and disk in the system, is also a unique rating system makes an assessment of memory, processor video card and determines compatibility with the new operating system. Tab memory has special floating window, which allows real-time tracking of physical memory loading. 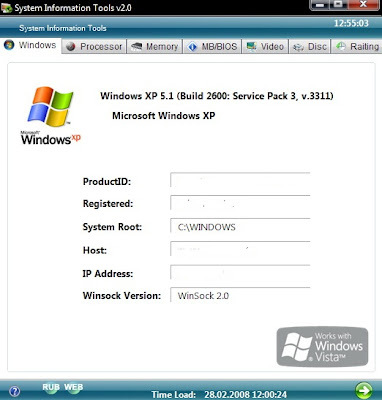 Vit XP Tweak - Packet utilities for configuring Windows XP. Includes utility to clear the hard drive of unneeded files, manager autoloaded during system applications, the module removing installed programs, utility system information and the very numerous (OS tuner). it XP Tweak thoughtful interface is where all the settings podelenny for 5 categories which, in turn, have subcategories. GOOD SOFTWARE IS MADE IN UKRAINE!